Your body is svelte and chiseled. You are a greek goddess and you look dazzling in that dress you’re wearing. You made that dress with your own hands, or rather ‘hand’ because your left hand was tied behind your back – just for fun. The dress is made out of nothing but scraps of plastic Walmart bags you collected from the ocean while rescuing sea turtles caught in garbage. You ‘unschool’ your well-behaved and genius children who have already read all the classics. And gee wiz, if sweet Junip and feisty Cosmo are only four and six years old. Your children are also models for Calvin Klein. Your ec0-friendly ranch style home sits on 25 acres of organic land, it’s perched next to a lake your family has owned for three centuries. You have a chapel directly across from the lake made out of glass and twine. You meditate there every morning at 5am. Sometimes, after your most divine meditations, you write about your revelations of true love – when you do this doves cry. You maintain a daily 5-mile barefoot run with darling Junip snuggled in your hand-woven wrap, happily breastfeeding on demand as you pound the pavement. You’ve already written three eBooks and you’re working on a fourth right now. 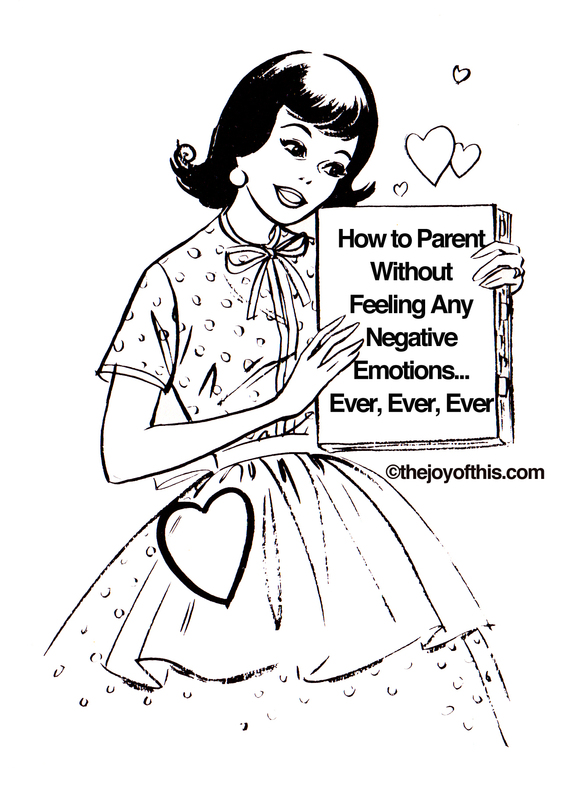 The title is, “How to Parent Without Feeling Any Negative Emotions … Ever, Ever, Ever.” You’re currently taking pre-orders for this book. You started an orphanage. It’s named after you. Mother Teresa came back from the dead to be there for its grand opening. Your husband sometimes logs onto your blog so he can write 850 words on what a fantastic woman you are. You are always totally surprised when this happens. You run giveaways on your blog. Your last prize was a chance to babysit one of your kids. 500,000 people took part. Mother Teresa won. You post photos of your home on Instagram. Martha Stewart takes notes. You have a Pinterest account and you only pin your own blog posts. You have a cat named Princeton, he uses the toilet instead of the litter box. You taught him this in under 30 minutes. Your home made mattress, the one you crafted out of goose feathers you collected by hand in a field where the geese wandered freely is beautiful, but doesn’t help me much if that’s the only thing you share. I would like to know a little more about you, your struggles, your honesty, your screw-ups, and your “I can’t believe I did it” successes. Show me your vulnerability. Tell me your most wicked stories. Share your most humbling learning experience. Tell me where it hurts and why. Let me know you’re not that much different from me. Because I really do have enough Barbies in my life, and your perfection only makes me distrust you. just please don’t try so hard to impress me with your world. Young love on the kitchen table paragraph? thanks, that’s spilled coffee EVERYWHERE! This is a wonderful post and very very truthful. I’m glad you liked it! Thanks for commenting! haha …. yes we all need a bit more hard truths and less fluff in our daily lives! I blog for years but couldn’t keep up with all the super mommy bloggers …..
Lipstick out of beets with self made hammered out molds? OMG, that was hilarious! I’m with you….I like to connect with real mom bloggers. Life is messy,fun,challenging, and all very real. It’s time to burst the perfect mommy bubble. If it isn’t messy, you aren’t doing it right!! Hilarious!!! I really love the honesty- and the laugh-out-loud humor! OMGoodness, Joy! This made me laugh so hard that I spit out my raw milk organic chai tea latte all over my home-birthed baby, who I was wearing in my wrap that I picked up on my fourth mission trip to Africa…or was it my fifth? I’ve lost count. Hilarious – I really enjoyed this. My word girl! I. love. your blog!!!! You make me belly laugh every freaking time, thank you so much! Every mama needs to know everything we do, we do our best! Although to be honest, I kinda wanna go live with the super mommy. Unless she makes me get up at 5am. Then forget that! This is the first time I’ve ever replied to a post. Ever. But I believe I came across this for a reason and it was too powerful for me not to respond. I’m still trying to figure out all the areas you hit for me and the extent I have been touched. Your honesty and directness is inspiring. Thank you. Don’t ask me what I was searching for but this needs a reprise. Amen to it all (from someone who probably fits that blasted mommy blog mold more than she really wants to).